Snow 7 Plus HD Color Portable Video Magnifier with OCR/TTS - 3.5 Hours of Battery Use! 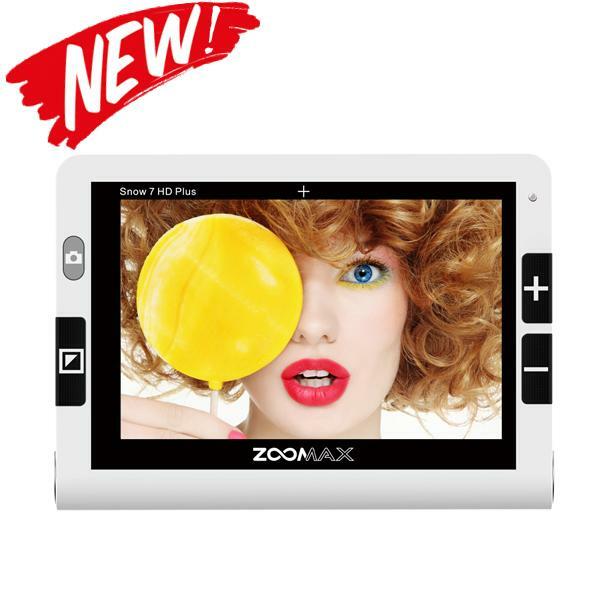 Zoomax Snow 7 HD Plus is the first 7 inch handheld video magnifier in the global market adopting text-to-speech technology. Offering storage for up to 1,000 images and superb distance viewing, Snow 7 HD Plus is a new entry for low vision people to regain independence. Two versions with text-to-speech included and excluded (advanced and basic version) are both available. Feeling hard to read a book? We've got you covered. Zoomax Snow 7 HD Plus enables the visually impaired to read materials on long pages in 20 languages (more are coming in the future). A full page can be scanned at a time, and half of an A4 page is most recommended. The page will be displayed as text in 4 high contrast colors as device reads for users, facilitating the hearing and seeing simultaneously. Snow 7 HD Plus is the first 7-inch video magnifier exclusively offering storage for up to 1,000 images saved. The device also supports 2-way image transmission between PC through USB cable exclusively. With large storage few handheld video magnifiers could achieve, you can record more information into this portable video magnifier. Thanks to 13 Megapixel camera, Snow 7 HD Plus now allows low vision users to view distinctly both in close-up and in distance. From fixed restaurant banner, to flash scene on the TV screen, you can see them easily using distance viewing. Great color rendition can present every detail explicitly without blur. Panning keeps the whole magnified image visible. But did joystick panning bother you? You deserve an easier way. According to long term research on usage pattern covering aged users, Snow 7 HD Plus applies touch panning based on sensitive touch screen, free to be handled even with trembling hand. Just enjoy! Reading line can help to locate the content so that users can catch the words easily. The Reading line on a big screen can be especially supportive for people with vision distortion. Snow 7 HD Plus adds 2 types of reading line, horizontal and vertical, for better reading experience. Standby mode is adopted to save power and avoid frequent turn-on/off of the device. By pressing Power button shortly, you can turn on/off the screen immediately while Snow 7 HD Plus keeps on, so the reading can be continuous and smooth. A swivel arm tailored for Snow 7 HD Plus is for a stable, no-tremble photo freezing before text-to-speech in advanced operation and comfort writing in real-time viewing. To match different needs, the height is adjustable for optimal use.